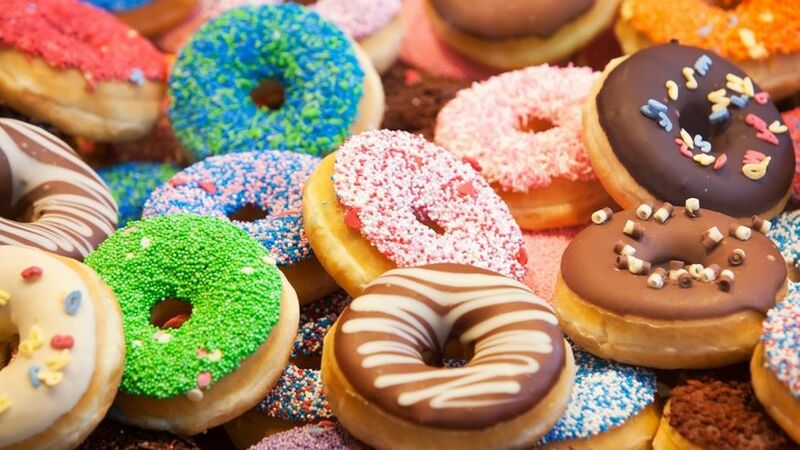 The Dutch referred to donuts as olykoeks, which means oily cakes. Donuts are one of the most popular foods of all time: sweet, delicious & can be eaten on the go. National Doughnut Day is June 5th. It was established to celebrate the Salvation Army donut bakers who made donuts for the soldiers during World War I. The origin of the doughnut is heavily debated. The concept of fried dough is not exclusive to one country or culture and variations of the doughnut can be seen across the globe. The exact place where the first donuts were made is unknown and nobody knows who made the very first doughnut. The history of the doughnut goes back centuries, long before the discovery of the New World. In ancient Rome and Greece, cooks would fry strips of pastry dough and coat them with honey or fish sauce. The earliest origins to the modern doughnuts are generally traced back to the olykoek (“oil(y) cake”) Dutch settlers brought with them to early New York (or New Amsterdam) in the early 18th century. These doughnuts closely resembled later ones but did not yet have their current ring-sized shape. The first cookbook to mention donuts was an 1803 English cookbook with an appendix of American recipes. The habit of police officers going to donut shops began in the 1950s when they would go to donut shops to do their paperwork late at night. Donut shops were often the only businesses open at that hour and the owners were happy to have police presence so late at night. Hanson Gregory, an American, claimed to have invented the ring-shaped doughnut in 1847 aboard a lime-trading ship when he was 16 years old. Gregory was dissatisfied with the greasiness of doughnuts twisted into various shapes and with the raw center of regular doughnuts. He claimed to have punched a hole in the center of dough with the ship’s tin pepper box, and to have later taught the technique to his mother. By the mid-19th century, the doughnut looked and tasted like today’s doughnut, and was viewed as a thoroughly American food. In 1920, Russian-born immigrant Adolph Levitt created the first automated doughnut machine. By 1925, the invention earned him $25 million a year and it was a fixture in bakeries across the country. The machine-made doughnut was a hit of the 1934 World’s Fair in Chicago. In France donuts were once called 'Pet de Nonne' which translates to nun's farts. The origin of the name of doughnut is up for debate. Some believe it refers to the nuts that were added to the dough to add flavor. Others believe that the name comes from a recipe where by hazelnuts or walnuts were placed in the center of the cake as that part rarely cooked properly. Placing of the nuts in the middle of the dough avoided having an uncooked center. A third thought is that related to the shape of the doughnut. The dough was often tied in a knot style, a dough knot evolved into doughnut. The donut with a hole in the center was likely created because the center was never able to fully cook and it would lead to stomach issues. Cutting the center out allowed the donut to fully cook more evenly and eliminate raw dough. Doughnut vs. Donut: The Official Dictionary Spelling of the word in question—if you’re into that sort of thing—is “doughnut.” The expedited, simplified, Americanized spelling of “donut,” as Grammarist tells us, has been around since at least the late 19th century. It didn’t catch on, though, until late in the 20th century. There are two types of doughnuts, those made from a yeast-based dough for raised doughnuts, or those made with baking powder or baking soda for cake doughnuts. In Boston there is one donut shop for every 2480 people. After frying, ring doughnuts are often topped. Raised doughnuts are generally covered with a glaze (icing). Cake doughnuts can also be glazed, or powdered with confectioner’s sugar, or covered with cinnamon and granulated sugar. They are also often topped with cake frosting (top-side only) and sometimes sprinkled with coconut, chopped peanuts, or sprinkles. The filled doughnut is a flattened sphere injected with fruit preserves, cream, custard, or other sweet fillings, and often dipped into powdered sugar or topped off with frosting. There were donuts made with potato starch instead of flour and they were called spudnuts. Spudnuts was the first fast food chain to open in Los Angeles but it is closed now as a franchise. There are approximately over 10 billion doughnuts made in the United States each year. Dunkin’ Donuts is the largest donut chain, with 11,000 stores in 33 countries serving more than 5 million customers per day. The first Dunkin’ Donuts was opened in 1950, a revamp of William Rosenberg’s coffee-and-doughnut shop Open Kettle. The world record for eating 47 cream-filled glazed donuts was set in 2007. In Oregon a donut shop called Voodoo Doughnut once offered donuts coated in Pepto Bismol or Nyquil. The FDA eventually put a stop to it. The most iconic donut shop in Hollywood is Randy's Donuts. It has appeared in many movies including Crocodile Dundee and Iron Man 2. There are more doughnut shops per capita in Canada than anywhere else on the planet. Canadians eat more doughnuts than any other country’s citizens. Although the doughnut is often seen as an American icon, it has become Canada’s unofficial national snack. The cronut, which is a croissant-donut combination, contains about 1330 calories. National Doughnut Day, or National Donut Day – celebrated in the United States, is on the first Friday of June of each year, succeeding the Doughnut event created by The Salvation Army in Chicago in 1938 to honor those of their members who served doughnuts to soldiers during World War I. The holiday celebrates the doughnut. Many American doughnut stores offer free doughnuts on National Doughnut Day. The first mention of donuts in print was by Washington Irving, the author of The Legend of Sleepy Hollow. By now, the stereotype of the doughnut-loving cop is well-established — but how did it start? The short answer is that police officers have long worked odd hours, but the options for food in the wee hours haven’t always been plentiful. The option to pick up a doughnut dates to the years after World War II. Salvation Army volunteers would take donuts and coffee to soldiers in France in the trenches during World War I.
Krispy Kreme created the world’s most expensive doughnut. The £1,000 (around US$1400) tower of sweet decadence was created with a royalty of gilded leaves, a gold dusted Belgian chocolate flower and edible diamonds, all for a good cause. Krispy Kreme unveiled the world’s most expensive donut at Selfridges department store in UK in 2014. The confection was created to mark National Donut Week — a fundraising effort benefiting the UK Children’s Trust charity. Canada makes only 1 billion donuts a year but has more donut shops per capita than any country around the world. The largest doughnut ever made was an American-style jelly doughnut weighing 1.69-tonne (3,739-lb), which was 4.9 m (16 ft) in diameter and 40.6 (16 in) high in the center. It was made in Utica, New York, USA on January 21, 1993. The largest box of doughnuts is a Krispy Kreme box weighing 135 kg (297 lb 10 oz) and was produced by The Kuwait Food Co. Americana (Kuwait), in Kuwait, Kuwait, on 30 May 2009. The box was filled with 2,700 pieces of Krispy Kreme doughnuts. The enlarged box was an exact replica, even down to the labels. The box was 5.9 m (19 ft 4 in) long, 4.10 m (13 ft 5 in) wide and 87 cm (2 ft 10 in) deep. Renee Zellweger ate 20 donuts a day to help her gain weight for the movie Bridget Jones. Every year in the United States more than 10 billion donuts are made. The world record for donut eating in 2002 was 49 glazed donuts consumed in only eight minutes. The largest doughnut mosaic was created with 7,040 doughnuts at the Lviv Pampykh Festival in Lviv, Ukraine, on 07 Jan 2012 The attempt took place on Ukrainian Christmas day (7 January) as part of their Pampukh Festival. The longest line of doughnuts is 3,453.41 meters (11,330.07 feet) and was achieved by Hamburg Enhanced Recreation Organization (H.E.R.O.) (USA) at the Manly Bennett Memorial Park in Hamburg, Michigan, USA, on 19 June 2015. The largest serving of doughnuts weighs 856 kg (1,887 lb 2.56 oz) and was achieved by Television Company “ERA” 7 Channel (Kazakhstan) in Almaty, Kazakhstan, on 7 September 2014. In 1933 donuts were given the title the 'Hit Food of the Century of Progress' at the Chicago World's Fair. The most sugared jam doughnuts eaten in 3 minutes, without licking the lips is 6 and is held by Lup Fun Yau who equalled the record at The Sun Offices, London, UK on the 2 May 2007. Great Article, we much value your opinions and appreciate you for sharing this valuable content.